Your favorite Harlequin Heartwarming authors are back with ten all new Christmas stories set in charming Christmas Town, Maine. This year, a stocking brings a special holiday wish to each story. Kinley Reed and Ian Mackey’s teenage rivalry-friendship was both frustrating and bittersweet. After he crushed her heart, Kinley was glad to see Ian go. But now he’s back. Both successful architects, they soon find themselves in competition once again. Ian also needs Kinley’s help to save his troubled sister. Can Kinley set the past aside? Will Ian finally win the love of his gingerbread girl? The temptation of a childhood crush! 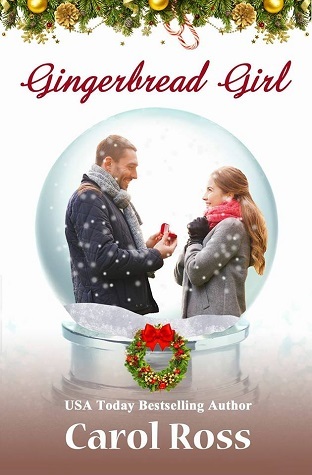 Included in the Heartwarming Holiday Wishes box set, Carol Ross brings us Gingerbread Girl, a sweet holiday novella about overcoming adversity to find your happily ever after! The characters are easy to like and the plot is both a seasonal delight, as well as a heartfelt story of reconnecting with loved ones. I really enjoyed it! Architect Kinley Reed is keeping herself busy this holiday season! Not only is she overseeing the judging of the annual Gingerbread Dream Home competition, but she’s also putting the finishing touches on her own design that she’s hoping will finally take her to the level she’s hoped to achieve with her career. She can’t believe her horrible luck when her old nemesis returns to town and moves right on in to her niche in town! Ian Mackey is back home from the big city to get his troubled teenage sister back under control and on the right path. He didn’t get her opinion on the matter, but he plans to get his old friend and secret crush Kinley to take her under her wing and make sure everything stays on the up and up when he heads back home! This holiday season, warm your heart with 10 connected sweet, clean and wholesome holiday romances set in Christmas Town from 10 Harlequin Heartwarming authors who are USA Today bestselling authors. Heartwarming Holiday Wishes will bring you laughter, tears, and happily-ever-afters (no cliffhangers), for more than 1000 pages.